The surgeon needs to be very precise and accurate in his/her injections while conducting nasal fillers. Thorough knowledge of the nasal anatomy is the basis to perform such procedures. 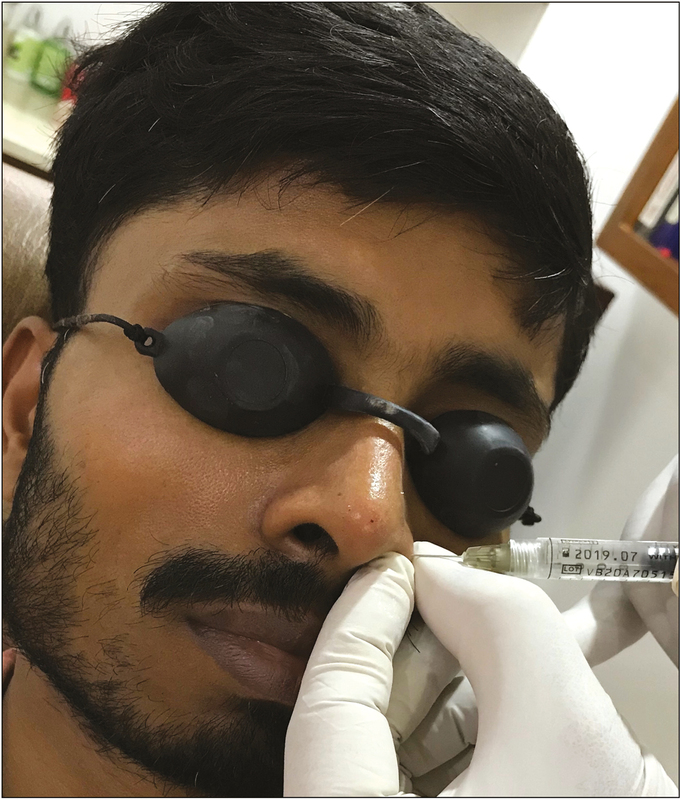 Nasal dorsal correction has been the most common indication for non-surgical nose reshaping, but in this article, the author discusses about practical tips to get best results. 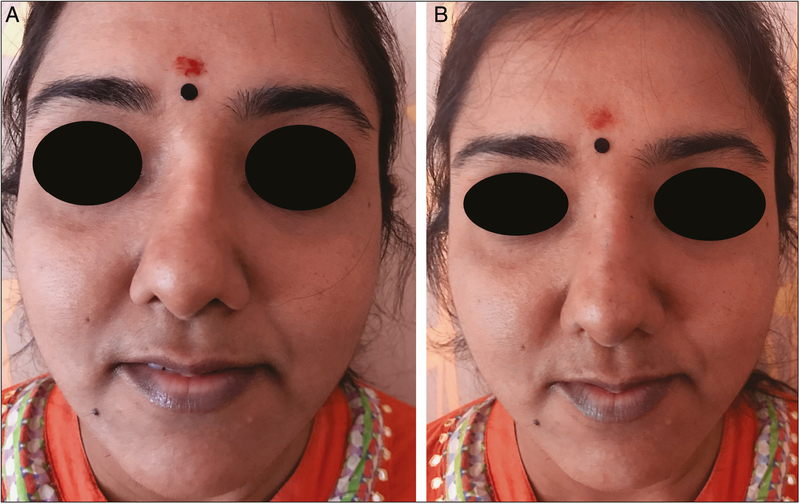 After thorough discussion with the patient and signing of the consent form, pre-procedure pictures are taken—front view, lateral views, and basal views. Deformities and the intended sites of injection are marked and local numbing cream containing lidocaine and prilocaine is applied. After an interval of 45min, the injections are administered at the intended sites. For dorsum corrections, usually two or three points are injected directly on the dorsum, needle directed at 45° from the dorsum [Figure 1], at supraperiosteal level with care being taken to aspirate before and avoid large boluses. The author suggests to inject in small boluses only, less than 0.02mL per site. Immediately after injection, gentle molding should be done. More filler can be added if required to get the desired result. Tip correction is desired mainly for lifting the tip in case of parrot beak–shaped nose (drooping tip) or to give it more definition and contour as in case of box nose shape. For tip correction, the needle is placed directly on the nasal tip, obliquely to the lip axis at 45° [Figure 2], and injected at intradermal or subdermal level. Alar correction is indicated to correct deformities such as difference in heights of both alar or to reshape them. For alar correction, the needle is placed directly on the alar areas requiring correction, directed at 45° [Figure 3], and injected at intradermal level. First and foremost is to always aspirate before injecting. Avoid big bolus injections and give very small bolus. Anatomical knowledge of safe area of injection is very important. Better to avoid overcorrection and always keep hyaluronidase injection ready in case of an adverse event. After injection, examine the skin well and always look out for blanching of skin, if any. No massaging of the nasal injected area for at least 3–4 days. Post-procedure pictures are taken with same views as mentioned earlier. Patients are given mirror for self-inspection, and once they are satisfied, post-procedure instructions are explained to them in detail with special emphasis on a follow-up visit scheduled after 3 weeks and touch-up if required to be performed during this visit itself. Hyaluronic fillers (HA fillers) are now the preferred treatment options for patients wanting non-surgical nose reshaping and even for those who have undergone surgical rhinoplasty but want slight corrections for uneven shape. HA fillers give immediate results with almost no downtime and happy clients as seen in [Figure 4]. Aspiration is mandatory when contemplating nasal fillers as even a drop is enough to cause adverse events including blindness. Nasal fillers is an effective treatment option for patients seeking non-surgical nasal contouring and reshaping. But the author wants to caution and emphasize the need to know the surgical anatomy of various vascular structures in and around the nose which can lead to adverse events. Though it seems very quick and lucrative, the author warns of the risks, such as vascular emboli and necrosis,,vision loss, and infection, associated with fillers even in experienced hands. Vision loss or blindness is the most dreadful of all due to proximity to the neurovascular arcade. If any vascular compromise is suspected, protocol suggested by DeLorenzi is recommended. HA fillers offers a great hope for clients opting for non-surgical nasal reshaping. 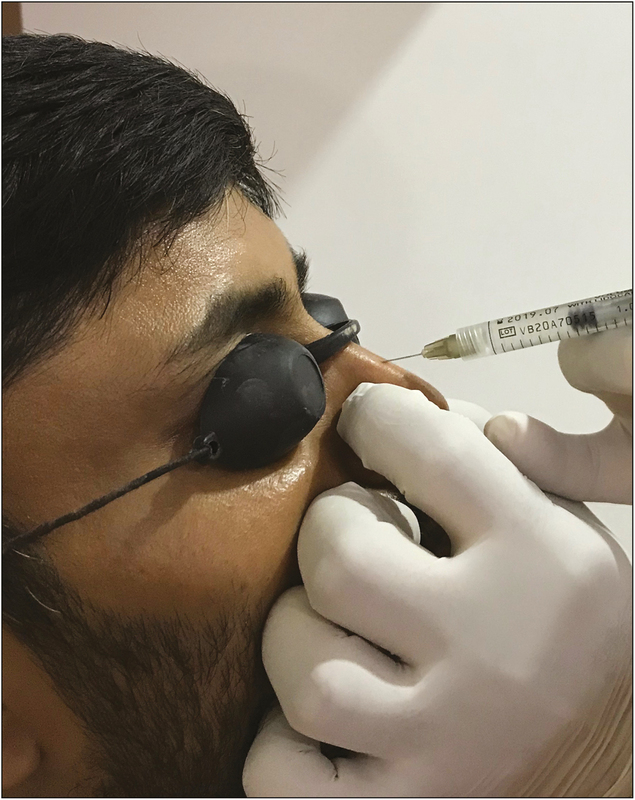 Though it is quick and with almost no downtime, overaggressive treatment should be avoided for nasal fillers due to its risks involved as mentioned earlier including blindness. Heden P. Nasal reshaping with hyaluronic acid: an alternative or complement to surgery. Plast Reconstr Surg Glob Open 2016;4:e1120. Grunebaum LD, Bogdan Allemann I, Dayan S, Mandy S, Baumann L. The risk of alar necrosis associated with dermal filler injection. Dermatol Surg 2009;35 Suppl 2:1635-40. Inoue K, Sato K, Matsumoto D, Gonda K, Yoshimura K. Arterial embolization and skin necrosis of the nasal ala following injection of dermal fillers. Plast Reconstr Surg 2008;121:127e-8e. Kim SN, Byun DS, Park JH, Han SW, Baik JS, Kim JY, et al. 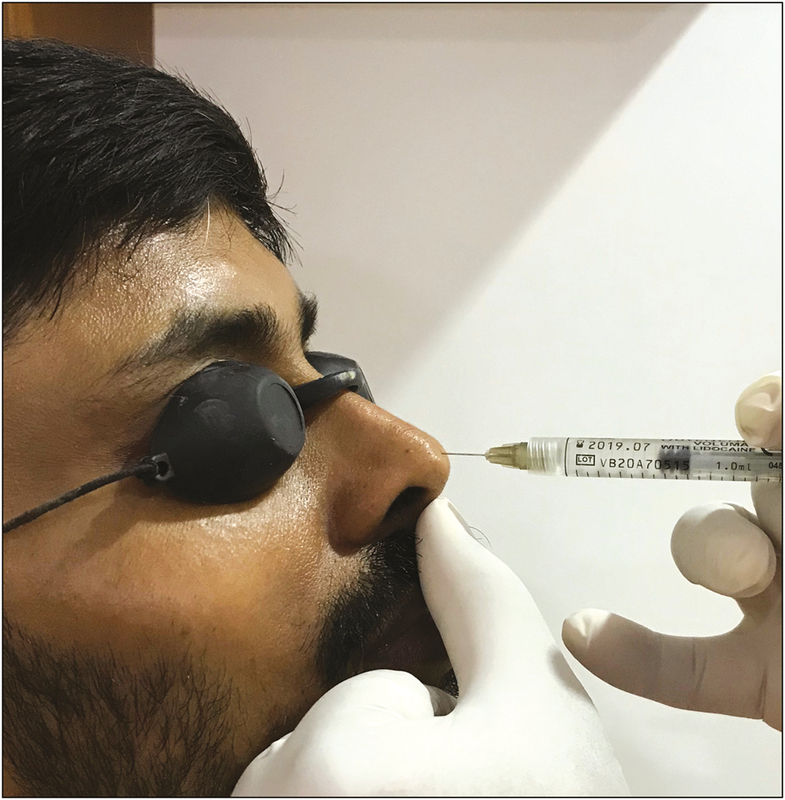 Panophthalmoplegia and vision loss after cosmetic nasal dorsum injection. J Clin Neurosci 2014;21:678-80. DeLorenzi C. Complications of injectable fillers, part 2: vascular complications. Aesthet Surg J 2014;34:584-600.